Ok, so it is finally time to finish posting about this trip so we can move on to current events! After leaving Lubbock, we made the final journey on to Ruidoso, NM. Once there, we stayed in a vacation lodge with Kevin's parents and sister and neice and nephew. 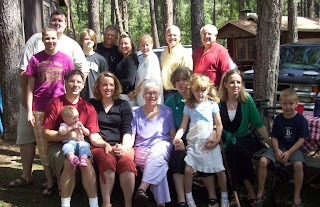 The rest of the clan stayed at a campground with cabins. So most of the activities of the week took place at that campground. Here is Avery checking out her new surroundings. This reunion was for Kevin's dad's side of the family. Here are some family shots. These are the first generation of the family. There were 12 brothers and sisters total, here are the 5 that were present at the reunion. 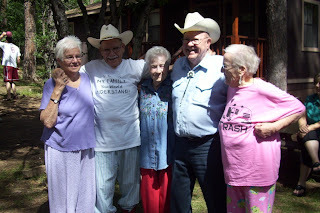 Kevin's grandma, Doris, is the first on the left, then Ted, Freida, Jack, and Joyce. 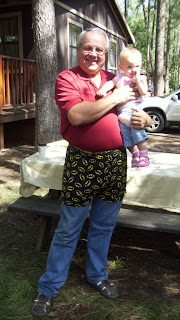 Avery and her Grandpa sporting the same fashion sense. 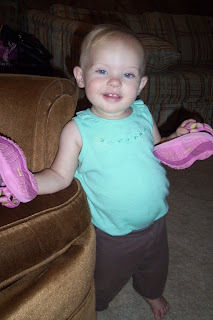 Diapers outside of the pants and socks with the sandals. Priceless. Reunion memories at their best. 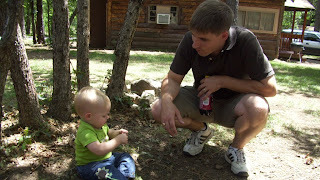 The oldest and youngest at the reunion. 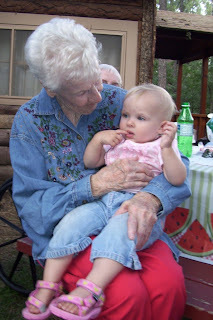 Great-Aunt Frieda 89 1/2 years old, Avery, 1 year old. 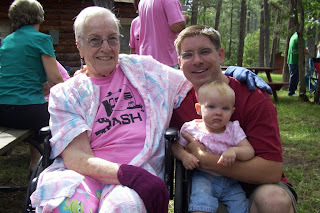 Those of the Dodd clan represented at the reunion. 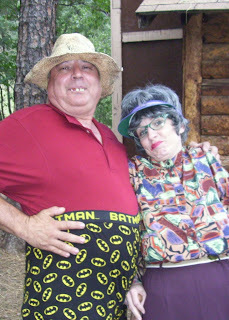 One evening we went to a great chuckwagon buffet/singing performance. It was a great show and good food, but unfortunately my camera batteries were dead. The only photo I got while we were there was this one on my phone. I wanted a photo of this though, because it closely represented all the places I have spent time in my life. 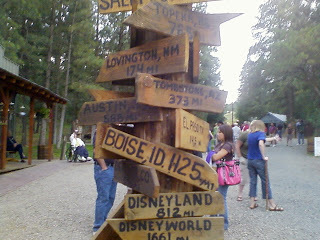 Topeka, KS (near Lawrence) 765 miles, Austin 588 miles, Tombstone, AZ (near Tucson) 373 miles, Disneyland 812 miles, DisneyWorld 1661 miles. One evening, the clan put on a talent show. Here are Amy and Brad dressed and in character for their stellar performance as a hillbilly couple crashing the wrong family reunion. They were hilarious and very popular! Avery did very well with all the new people and places. 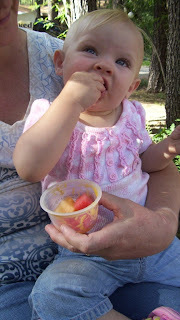 Here she is trying and loving watermelon for the first time. 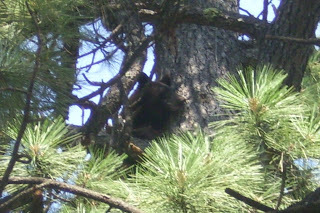 This is a bear that we saw in a tree near the campground. It was a mama bear and 3 cubs all in the one tree. You can see the mama's head in the center of this photo. Amazing, and a little bit scary. Finally, after much visiting and laughing (there was a lot of laughing at this reunion). We headed home. This was much of what Avery did. We drove home over the course of 2 days with Grandma Doris in the car (brave woman). But it went well and survived the trip home. It was a fabulous trip and wonderful to see all the family and friends that we saw, but it was also great to get home. Now it is time for more current blog posts! So call me slow! No really slow! I love the reunion update! You have a great Dood connection. Keep it healthy and intact! 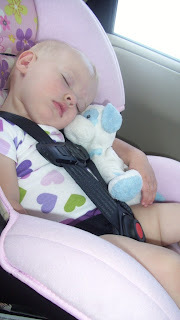 Avery is so precious and lovable.